For Ben Gross, explaining automation is a simple proposition. Automated machines bring speed, reliability, and precision to the manufacturing process. Where Ford perfected the assembly line, today’s automated machines improve on that a thousand times over. Instead of a tool belt, it can be as simple as a push of a button. But a machine is only as good as its operator. Or, more precisely, it’s software. 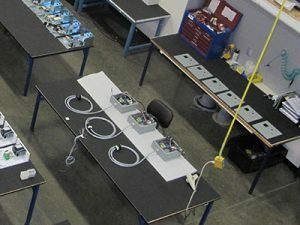 At Prairie Electric, automation is used more for the precision and the time it saves. As a builder of automation panels, though, they have no need to mass-produce any one product. Every machine their crews build a panel for needs a custom touch. The team also employs automated testing machines that were designed and built in house. These machines are used to test the boxes they built, not only saving time over manual testing but improving accuracy as well. Previously, two technicians may perform 100 test steps on a single box for 20 minutes with an accuracy rate of 97%. Sounds good, right? With the automated test machines, one technician can now test the same box in five minutes while performing 200 test steps. And all of that information is automatically stored electronically. The speed, accuracy, and reliability of these machines have helped the company compete in the global market. While automation plays a part in the shop, the team concentrates on the other side of the coin: building the panels that make it possible. No matter if a client has a simple idea or full-blown schematics, they’re able to give them the control panel, software, and training their clients need to become automated. Automation provides industries with fast, dependable work to better make their products. But it’s the panel and software combination that allows those machines to make precision movements each and every time. Automation has made the, producing materials, products, and machinery at a faster rate than ever before. From Ford’s first assembly lines to today, automation has made the manufacturing industry more efficient and consistent. With well-engineered control panels powered by advanced software and coding, it all starts with the push of a button.